Indian Singers’ Rights Association (ISRA) is a Non-profit making Company Limited by Guarantee under the Companies Act, 1956 and was born on 3rd May, 2013. The Copyright Act 1957 (14 of 1957) was amended by the Copyright (Amendment) Act, 2012 (27 of 2012) on and w.e.f. 21st June, 2012. By virtue of the said amendments, Singers were accorded a Special Right to be known as the “Performer’s Right” on their Performances. Section 38, 38A, 38B, 39, &39A pertain to performances of the performers and their Rights. The Copyright Act provides that a Singer -- as a Performer -- shall be entitled for Royalties in case of making of the Performances for commercial use. In order to be able to collect such Royalties, Section 33 of the Act requires that any organization which wants to commence or carry-on the business of issuing or granting licenses in respect of the Singer’s performance has to get itself registered with the Central Government. Thus, ISRA applied to the Registrar of Copyrights as per the requirement of the Copyright Act and the Copyright Rules to be registered as the Performers’ Right Society for Singers and on 14th June, 2013, ISRA became the 1st Copyright Society in India to receive the Certificate of Registration under Section 33(3) of the Copyright Act, 1957. ISRA is now registered by the Central Government vide Registration No. P.R.S-01/2013 as a Performers’ Society (Copyright Society) under Section 33(3) of the Copyright Act 1957 and is permitted to commence and carry on the copyright business in Performers’ Rights of Singers and other activities ancillary thereto for a period of 5 years w.e.f. 14th June, 2013. M/s. Lata Mangeshkar, S P Balasubhrahmaniyam, K J Yesudas, Usha Mangeshkar, Suresh Wadkar, Gurdaas Mann, Pankaj Udhas, Alka Yagnik, Anup Jalota, Talat Aziz, Kumar Sanu, Abhijeet Bhattacharya, Sonu Nigam, & Sanjay Tandon with support from M/s. 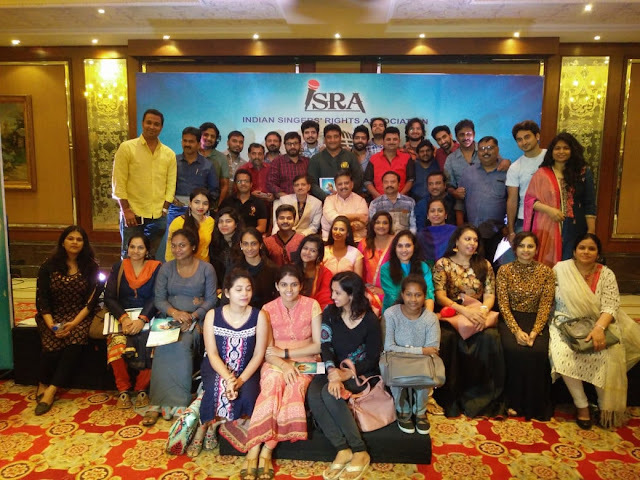 Asha Bhosle, Kavita Krishnamoorty, Shaan, Hariharan, Jassi, Sunidhi Chauhan, Mahalaxmi Iyer and many others formed the ISRA (Indian Singers' Rights Association) and are members of ISRA. Section 38 of the Copyright Act, 1957 affords the Performer (“Singer”) with a Special Right known as “Performer’s Right” in relation to his/her performance. Section 38A enlists “without prejudice to the rights conferred on authors” the Exclusive Rights to do or authorize for doing certain acts by the Performer. Thus, it is abundantly clear that the Performer’s Right is a distinct right from that of the Author. In other words the Performer’s Right Clearance is distinct and separate from an IPRS and/or a PPL License. Playing/Using/Makingthe songs of ISRA’s Singer members for commercial use amounts to commercial exploitation of the Performer’s Performance and hence needs a Clearance from ISRA on payment of prescribed Royalty as per ISRA’s Tariffs. By virtue of the provisions post the 2012 Amendments, it is now stipulated that anyone would require a Clearance from the Singers’ Copyright Society – I.S.R.A. and pay Royalty to play/use/utilize/perform film and non-film songs. Hence, the ISRA Clearance is in addition to any other License / Clearance that one would need to obtain, whether IPRS or PPL etc. This is a new Clearance which has come into being with the recent 2012 amendments. ISRA today controls 95% of the Performer’s (Singer’s) Rights and all the who’s who singers are members including singers from North, South, East & West of the Country. It is also affiliated itself with foreign overseas societies. ISRA COMPLETED THE CYCLE OF ADMINISTRATION, COLLECTION, AND DISTRIBUTION OF SINGERS’ ROYALTY THIS YEAR. Celebrating the 69th Republic Day of India, on 26th January, 2018, the Indian Singers Rights’ Association (ISRA) etched a Historic Occasion in its Life and that of Singers in India when it made the 1st ever Royalty Distribution of Rs. 51 lacs to Singers. ISRA distributed this Royalty for the period upto 31st March, 2017. This Royalty is being received by 730 Singers throughout the Country.